Time Sifters is a non-profit association of over 100 professional and amateur archaeologists and interested citizens, dedicated to discovering and preserving our archaeological heritage. Since its inception in 1986, the society has assisted trained archaeologists in major Calusa Indian digs, participated in creating the unique ‘Window to the Past’ exhibit at Historic Spanish Point, sponsored and/or participated in outreach programs “Trail of the Lost Tribes” and “Looking for Angola”, and provided significant support contributing to the preservation of local archaeological resources. A local chapter of the Florida Anthropological Society, Time Sifters has twice hosted the FAS Annual Meeting, most recently in 2015, and participates with and supports local college anthropology programs including sponsoring a paper competition for college students. Each year, Time Sifters sponsors monthly lectures on archaeological topics, all of which are open to the public without charge. 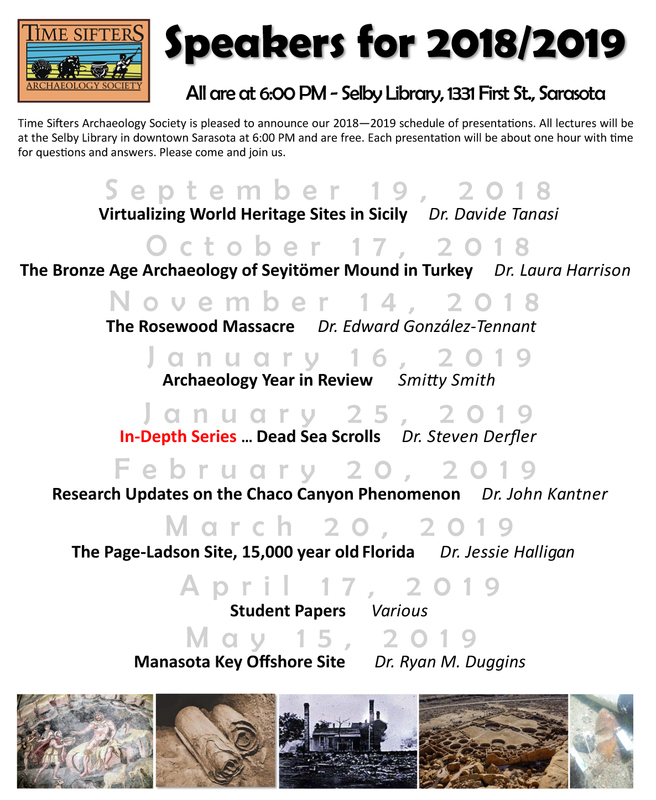 Time Sifters Archaeological Society represents Sarasota and Manatee counties. The third Wednesday of each month from September to May, except December, at Selby Public Library in downtown Sarasota. Please check our website to confirm the meeting time and place. The meetings are free and the public is invited.